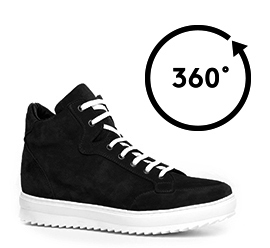 High-top elevator sneakers with velvety upper in black suede and super lightweight white sole. A chromatic contrast which enhances its lines and elegance. A casual and trendy handcrafted footwear ideal to increase height up to 4 inches (10 cm) in total comfort and secrecy.